We’re sorry you missed this tour. Please contact us if you’re interested in being notified about future Bhutan tours or if you’d like to join us for any of our other tours. Cancellation fees apply. Please read our Booking Terms and Conditions before registering. 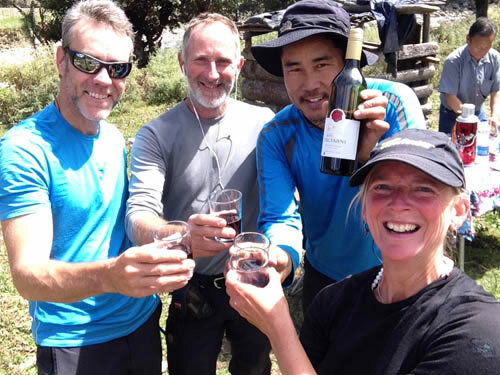 WanderTours Giving Program – A portion of your tour cost will go to supporting RENEW Bhutan – an organization helping women and children of domestic violence. Considered the most difficult trek in the world, this legendary adventure is for experienced and determined trekkers only. 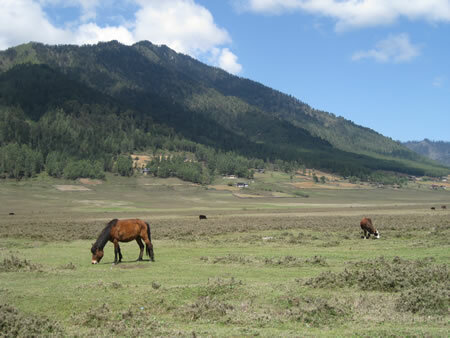 The route essentially combines the Jhomolhari and Laya treks, passes through the Lunana region and ends in Bumthang. The journey doesn’t disappoint with its breathtaking landscapes and ultimately reaches an altitude of about 18,480 feet–again, not for the faint of heart! The group will meet in Bangkok for the flight to Paro, Bhutan. For all who can attend, there will be a welcome dinner in Bangkok the night prior to departure, September 18. Flights leave Bangkok very early on the morning of September 19 (usually 5:30 a.m.) so it’s best to arrive in Bangkok at least 24 hours prior to departure to Bhutan in the event of flight delays. NOTE: On trekking days, you’ll rise early and, after breakfast, pack your bag and prepare your daybag with anything you’ll need for the day (water, snacks, camera, cold weather gear etc.). Once the group departs on foot, the tents will be dismantled by the staff and everything, including your main bag will be packed up on ponies. Though this entourage can be quite large, they will pass the group along the path and have camp set up again by the time the group arrives at the end of the day. Lunch and snacks are served along the way by the cook staff, but you’ll want to carry your own water, protein bars and treats each day. If you are comparing this itinerary to other published itineraries, note that distances, altitude and daily trek times vary because the trek has not been well-documented and distances and altitude are best guesses. We’ll immediately enjoy the magnificent beauty of the region as soon as we arrive in Bhutan. On a clear day, spectacular vistas of the Himalayas, the world’s highest mountains, make way for the rich, green Paro Valley. Stepping off the plane, you’ll be struck by the crisp, fresh air. We’ll be met by our guide and driver after going through visa control and customs and then proceed to our hotel. Following lunch, we may have the opportunity to visit the National Museum to see locally-made textiles, ancient armor, household objects, thangkas, weapons and other local artifacts. We also may visit Rinpung Dzong (monastery). If there’s time we may also walk Paro’s one main street to check out the local shops. Dinner and overnight at Bhutan Metta Resort and Spa or similar in Paro. We’ll spend another day in Paro to help everyone acclimate to the elevation. 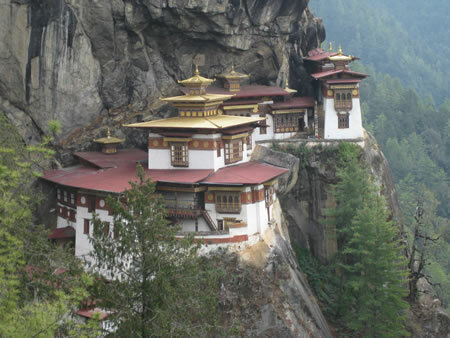 After an early breakfast, we’ll head out to hike the two or more hours up to Tiger’s Nest (Taktsang Monastery), Bhutan’s most iconic monastery, perched dramatically on the side of a hill. At the top, we’ll explore several temples and enjoy unparalleled views. On our walk back down, we’ll stop at the tea shop/cafe at the halfway point. Here, there is an amazing view looking back up at Tiger’s Nest. We will then proceed down and have a picnic lunch in the forest. Today, we will start our trek! We’ll begin with a bus ride to Drukgyal Dzong and then hike our way to Shana, which follows the Paro River. This is an easy walk along a farm road. If the weather cooperates, we’ll be able to see Mt. Jhomolhari (23,995 feet). On this first day of trekking, we’ll pass farmhouses, cultivated fields and small picturesque villages and will have to maneuver across a couple of suspension bridges. Overnight at camp in Shana. Altitude 9,251 feet. Distance 8.6 miles. Time 5 – 6 hours. The trail follows the river through a heavily forested area that is usually quite cool, with a few isolated farmhouses along the way. In the afternoon, expect rough terrain as the trail winds up and down. We’ll pass a junction en-route where another path leads north over the Tremo La to Tibet. Altitude 11,843 feet. Distance 13 miles. Time 7 – 8 hours. As we start our day, we’ll have views of Mt. Jhomolhari. After passing a small army post, the trail slowly leaves the forest line and gradually climbs into a beautiful valley, passing Tegethang, a winter home of yak herdsmen. Many yaks can typically be seen before arrival at Jhomolhari Base Camp. Mountains overlook the camp and visible nearby are the ruins of an old fortress used to guard Bhutan against Tibetan invasions. Camp at Jhomolhari Base Camp. Altitude 13,500 feet. Distance 9.3 miles. Time 5 – 6 hours. Today is a rest day! Though not actually a base camp for Jhomolhari (climbing from the Bhutan side is prohibited), it is located at the base of the mountain. This is a good day to take a break as we will have ascended nearly 6,000 feet in the previous three days. If you don’t feel the need for a break, there are numerous day hikes around the area. Today’s trek will start with a three- to four-hour-long climb before reaching Nyile La Pass at 15,419 feet. Expect spectacular views of Jhomolhari, Jitchu Drake and Tsheri Kang. Also in the distance will be Tiger Mountain. After the pass, we’ll descend to a circular hut just below Lingshi, where we’ll make camp. Coming down from Lingshi, we’ll have our first views of the truly mystical dzong atop a high hill. Altitude 13,123 feet. Distance 10.5 miles. Time 6 – 7 hours. This is a magical day and one of the easiest of all trekking days. Leaving Lingshi, we’ll enjoy a gentle climb to reach another delightful village, Goyok, which is set right below a 984-foot cliff. Another hour’s walk brings us to a lovely little valley with a huge waterfall at one end of Chebisa. The walk is leisurely with opportunities to linger. We’ll camp by the side of the river. Altitude 12,401 feet. Distance 7.5 miles. Time 4 – 5 hours. Today, we’ll start with quite a stiff climb through high pastures up the Gombu La Pass (14,300 feet) before dropping through forests of dwarf rhododendron, where the ground can be slippery. We’ll then head down to our camp situated near a riverbed. This valley is one of the most beautiful on the Snowman Trek. Altitude 13,100 feet. Distance 10.5 miles. Time 6 hours. Today, we’ll spend at least three hours climbing before reaching Jare La Pass (15,695 feet) where, once again, we’ll take in some stunning views of the Himalayas including Sinche La, Tiger Mountain and Jitchu Drake. We’ll then drop steeply down a forest trail to the Tsharijathang Valley where herds of takin (the national animal) and many yaks roam. We’ll then cross a knee-deep river (there may or may not be a bridge) before climbing up to Robluthang to our camp for the night. Altitude 13,451 feet. Distance 13.6 miles. Time 7 – 8 hours. Be prepared for one of the hardest days of the trek. We’ll climb slowly up to Sinche La Pass (15,977 feet) and be rewarded with stunning views, including the spectacular Tiger Mountain at the head of the valley. On a clear day, practically all of the mountains on the northern border are visible. Eagles, griffin vultures, blue sheep and yaks abound in this area. We’ll descend until we reach camp at a lovely spot by the riverbank. Altitude 13,254 feet. Distance 8.5 miles. Time 6 – 7 hours. 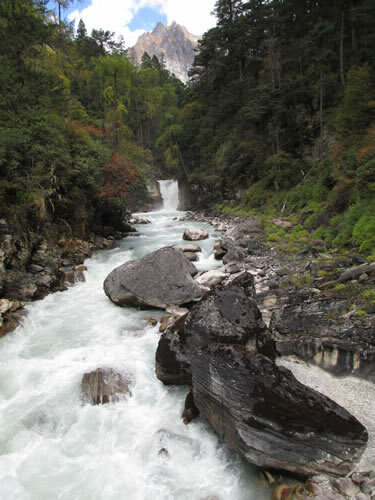 We’ll spend today walking along the river, one of the tributaries of the Mo Chu (Mother River), through a forest of rhododendron and silver fir, and then enter the village of Laya. The people of Laya are famous for their vertical stripe yak hair clothing and their strange conical bamboo hats. The women wear their hair long and with a great deal of turquoise and jade jewelry. The features of the people are more Tibetan/Mongolian than the Bhutanese who live in the central valleys. We’ll enjoy more views of the surrounding mountains. The afternoon may be spent at leisure or visiting village houses and chatting with villagers. Altitude 12,729 feet. Distance 6.2 miles. Time 4 – 5 hours. We’ll pause for a day of rest in Laya with the opportunity to meet the local people and to visit nearby sights. This picturesque village is surrounded by snowy mountain peaks. It’s possible to visit the local school here as well as the community’s dzong. This will also be a good day for a tent shower and to do some laundry. We’ll have a relatively easy descent to Tashi Makhang army camp where there is a checkpoint. But don’t get too accustomed to easy trekking. From there, we’re back to a mostly steep ascent, through forest and muddy trails, to Rodophu. If the weather is clear, we should have great views of the Tsenda Gang group of mountains. Altitude 13,451 feet. Distance 10.5 miles. Time 6 – 7 hours. 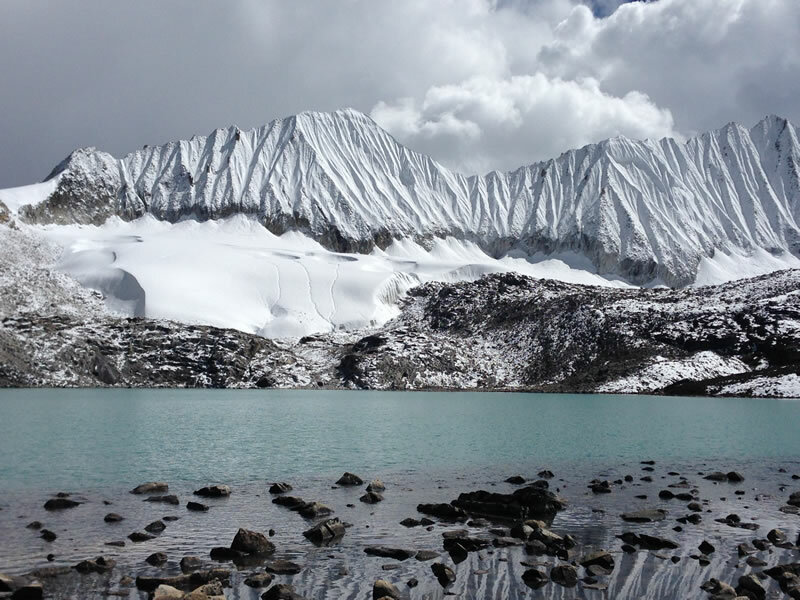 We’ll tackle the approximately three-hour climb to Tsemo La Pass (16,090 feet), which starts out with a gentle ascent and gets steeper closer to the pass. But from the pass we may be lucky enough to see the spectacular Gangla Karchung as well as Jitchu Drake and Jhomolhari. 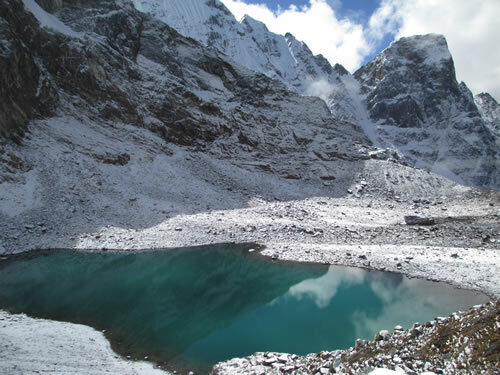 We’ll then descend and finally climb to Narethang, where we’ll camp at 16,200 feet, the first high camp on the trek. Altitude 16,200 feet. Distance 6.2 miles. Time 6 – 7 hours. We’ll start the day with a slow climb up to the Karakachu La Pass (16,465 feet), which will take two to three hours. 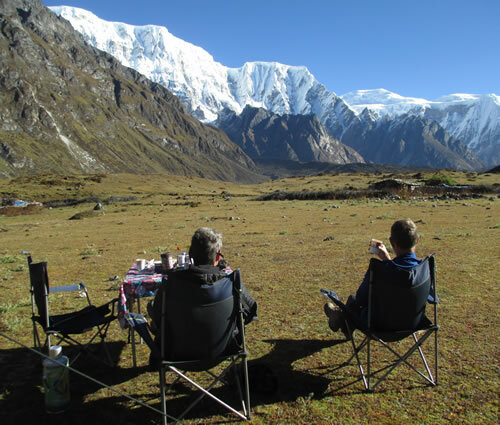 At the pass, we’ll be greeted by views of Karakachu, Tsenda Gang, Jejekangphu, and Teri Kang. The descent into the Tarina Valley is steep and long, perhaps taking 3.5 hours before hitting the valley floor where herds of takin roam. From there, we’ll have an easier two to three hour walk to camp. It will be a day of great views of the surrounding mountains and lakes. Altitude 12,795 feet. Distance 15 miles. Time 8 – 9 hours. Today will be a relatively short trekking day. During the early part of the day, we’ll follow a river for about an hour before ascending up a steep and muddy trail. There will then be a rigorous climb to reach camp near Woche. This area is where the beautiful Lunana region begins. Altitude 12,565 feet. Distance 7.5 miles. Time 5 – 6 hours. Today’s trek will take us through juniper forests and then cross a river from which we’ll have great views of Jejekangphu. A stiff climb then takes us past the Yumtso and Setso lakes and onward to Kesha La Pass (15,305 feet). It will take two to three hours to get to the pass. We’ll then descend into Tega Village and finally back up a steep, short climb to reach camp at Lhedi. Altitude 11,942 feet. Distance 9.3 miles. Time 6 – 7 hours. We’ll set out this morning by following the Pho Chu through the village of Lhedi before we climb for about 30 to 45 minutes to Chozo Dzong, which was built in the 17th century. After three or four hours, we’ll reach the beautiful villages of Dyotta and Thanza, where we’ll camp in a meadow with views of Table Mountain in front of us. Altitude 13,320 feet. Distance 9.3 miles. Time 6 – 7 hours. Today is another well-deserved rest day where we’ll be able to explore the village and visit with the people of Thanza. We’ll enjoy an excellent view of Table Mountain while also being able to catch up, once again, on laundry and showering. Today’s trek starts with a climb up to the ridge where we’ll catch a great view of Table Mountain and Thanza Valley below. We’ll cross the ridge and enter a small valley with a stream running through it. We’ll then follow the stream up the valley, enjoying the view of snow-capped mountains. After that, we’ll climb up out of the valley, crossing some small ridges to reach our campsite at Tshorim (16,814 feet). Altitude 16,814 feet. Distance 11.8 miles. Time 8 – 9 hours. This part of the journey is another highlight of the trip. The day starts with a short climb up to Tshorim Lake. We’ll walk around one side of the lake, enjoying a panoramic view of the Gophu La ranges. The final stretch up to Gophu La Pass (17,158 feet) is very short. After crossing the pass, we’ll descend to the base camp by walking along the ridge and enjoying a great view of Gangkar Puensum. 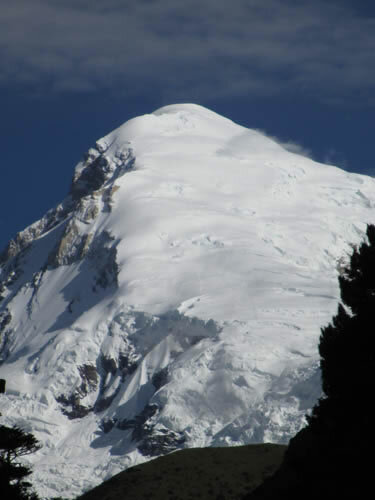 We may then detour left and climb up a pyramid-shaped peak for a better view or go directly down to the base camp (16,305 feet) near the Sha Chu where our camp will be set up. Altitude 16,305 feet. Distance 10 miles. Time 6 – 7 hours. We’ll follow the trail along the Sha Chu, which descends gradually to Geshe Woma. We’ll make camp there for the night. Altitude 13,780 feet. Distance 8.7 miles. Time 5 – 6 hours. The trail continues along the course of the Sha Chu for two to three hours until a steep climb to Saka La Pass begins. 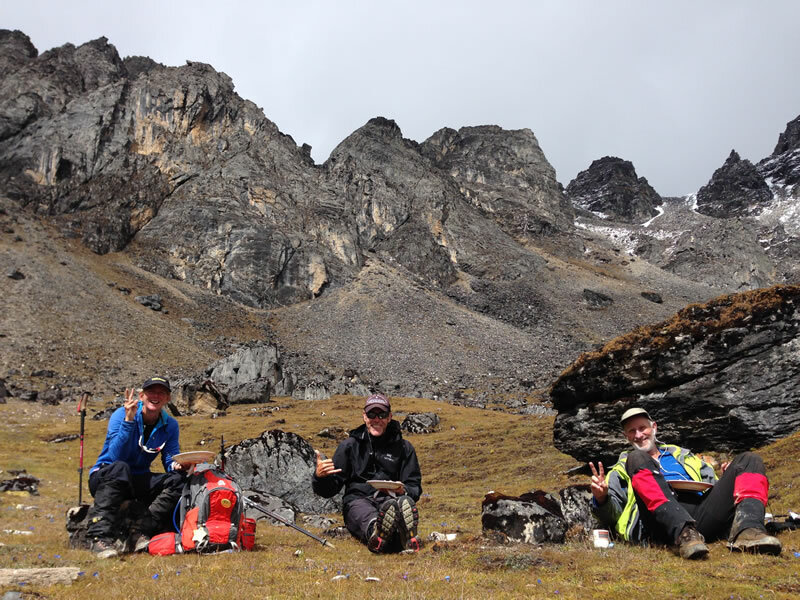 We will stop for lunch near a yak herder camp, then climb up to Saka La Pass (15,750 feet). On the descent to the lakes, expect stunning views and then another short ascent during which we’ll see small lakes spreading below towering mountain peaks. Altitude 13,125 feet. Distance 11 miles. Time 8 – 9 hours. 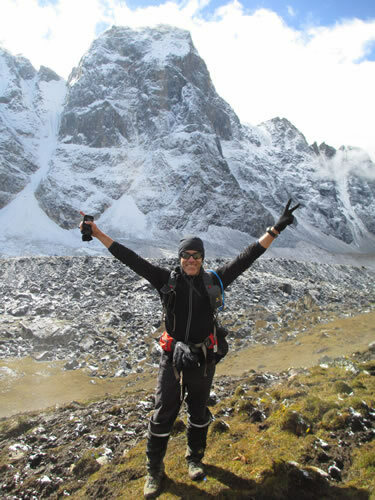 A short half-hour climb takes us up to Juli La Pass (14,435 feet). After crossing the pass, we’ll descend to the river side through dense rhododendrons, juniper and conifer forests. We’ll then cross a bridge and take a short climb to reach Dhur Tsachu hot springs. Legend has it that Guru Padmasambhava (Rinpoche) bathed at this very special spot in the 8th century. Altitude 13,750 feet. Distance 8.7 miles. Time 5 – 6 hours. From the spring, it is a long steady journey with great views of the mountains in Lunana. Eventually the ground levels out and we’ll see several beautiful deep blue lakes, yaks grazing on the surrounding pastures, and yak herders’ camps. Altitude 12,630 feet. Distance 10 miles. Time 7 – 8 hours. Today is the last day of the trek! Depending on where the previous day’s camp is, we may have to set off very early in order to reach Bumthang before dark. The path follows the Chamkhar Chu, descending gradually with few climbs. The trek ends when we reach Dhur village where a bus will meet us to drive us the short distance to Bumthang to check in to our hotel (yes!!!!!). Dinner and overnight at Rinchhenling Lodge or similar in Jakar (Bumthang Valley). Altitude 8,333 feet. Distance 6 miles. Time: 6 hours. After a well-deserved sleep-in, we’ll take a very easy walk to the Bumthang Valley, considered the seat of Buddhism in Bhutan. Here, we’ll have plenty of time to visit many of the region’s wonderful sights, including several temples such as Kurjey Lhakhang, the Tamshing Gompa (monastery), Jambay Lhakhang and the Jakar Dzong. If time permits, we might also visit the Swiss Cheese Farm where we can buy cheese, honey, beer and local fruit spirits. After breakfast, we’ll begin the drive west toward Paro. We travel over Yotong La Pass and then continue onward through Trongsa and over Pele La Pass. Soon after, we’ll turn south toward the Phobjikha Valley (10,000 feet). This valley is considered to be the most beautiful valley in all the Himalayas (to those who haven’t done the Snowman Trek!) and is the winter home to the endangered black-necked cranes. Lunch will be provided along the way. Dinner and overnight at Dewachen Hotel or similar in Gangtey. After breakfast, we’ll continue the westward driving over Dochu La Pass (10,000 feet) to Thimphu. Lunch will be at a restaurant in Thimphu. After lunch, we’ll have a chance to visit numerous sights in this small city, including the Institute of Traditional Medicine, the Folk Heritage Museum, the Textile Museum, and the Handicrafts Emporium for souvenirs and handicrafts. Dinner at a local restaurant and overnight at Hotel Kisa or similar in Thimphu. After breakfast, we’ll have a chance to do some more sightseeing in Thimphu that may include the School of Arts and Crafts and the National Memorial Chorten. There will be a final celebratory dinner and then overnight at Bhutan Metta Resort and Spa or similar in Paro. Following breakfast, we’ll leave for the airport for our flight to Bangkok. Flights usually arrive into Bangkok late in the afternoon (4:30 p.m. or later). Though you can connect with an international flight that night, you might consider staying in Bangkok for one night in case flights out of Paro are delayed (not uncommon). 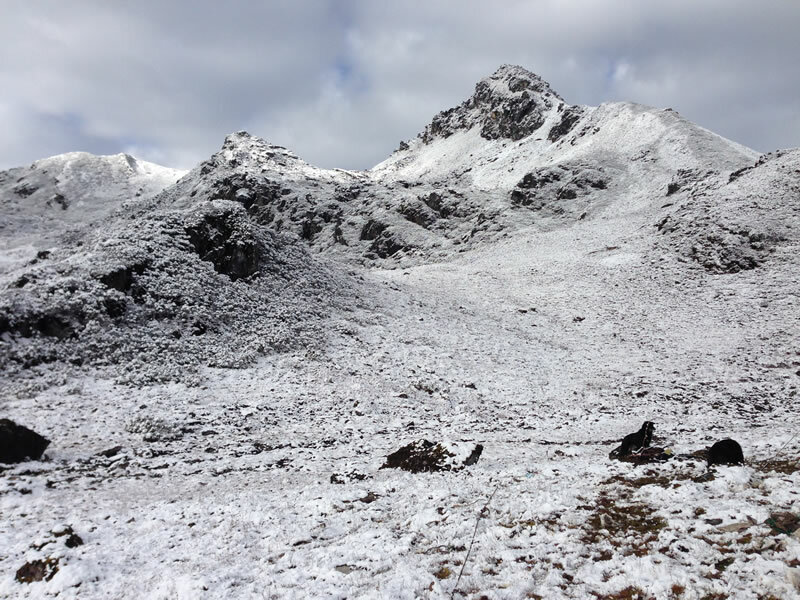 Want to see where we’re trekking? The green dotted line on this map is the route. Interested in sharing the cost with another traveler? We do our best to pair up travelers so as to avoid the single supplement. However, priority is given to the first deposits received. Please note that on the Snowman Trek, unless you are traveling with a husband/wife/life partner, we recommend you pay for a single so that you can have space in your tent to spread out. Price includes: Transportation in Bhutan, all meals, hotels, porters, guides, bottled water, visa, airport tax and tourist development fund fee. Also includes entrance fees to monasteries. Price does not include: Flights to and hotel in Bangkok, meals in Bangkok, evacuation insurance (required), souvenirs, personal purchases (such as books and snacks), beverages other than water and tips. This trip is limited to 10 people and requires an $800 deposit to secure your spot. It’s easy to register by making your deposit of $800! Simply click on the Register Now button below and you’ll be taken to PayPal where you add your debit or credit card information. You do not need a PayPal account to do this. Subsequent payments may be made through PayPal by sending to: beth (at) wandertours (dot) com. Register now via PayPal by clicking on the Register Now button. You do not need to have a PayPal account. 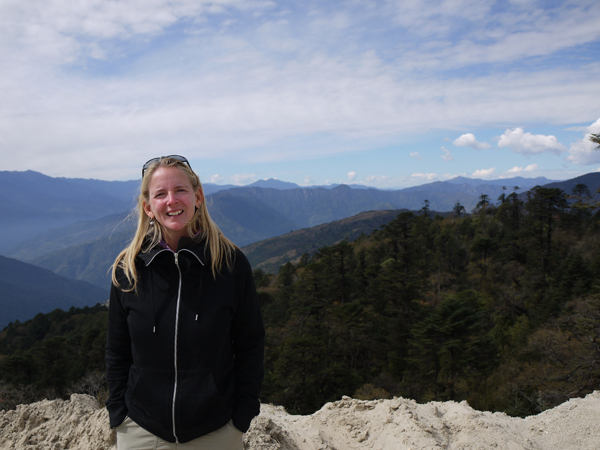 This will be her eleventh time to Bhutan, her fourth trek in the country, and her second Snowman Trek.